Connect a lobster clasp to a 5mm jumpring and then to one 5mm split ring using flat-nose pliers. Open a 7mm jumpring and connect it to the other 5mm split ring. Cut 110cm of tigertail and slide on a crimping tube. Thread it through a 5mm split ring which is connected to the lobster clasp, thread it back through the crimping tube and crimp the tube. Cut off the extra tigertail. Slide the beads and crystal pearls from the Swarovski crystal assortment onto the tigertail as shown in the illustrations. Slide on a crimping tube at the other end. Thread the tigertail through the 5mm split ring which is connected to the 7mm jumpring and thread it back through the crimping tube. Crimp the crimp tube and cut off the extra tigertail. 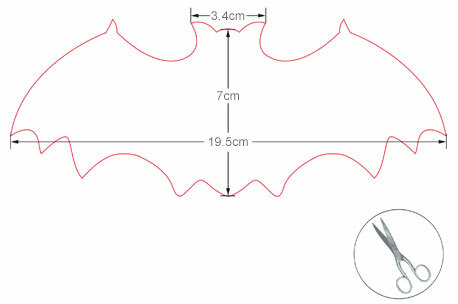 Draw the pattern or cut out the illustrations according to the sizes shown in the illustrations. 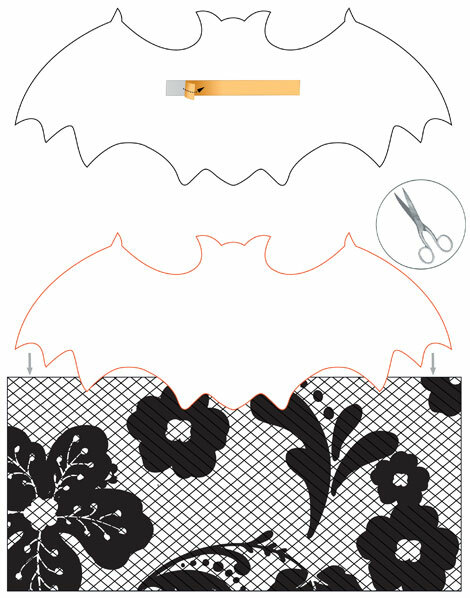 Stick double-sided tape on the back of the pattern, place it over the lace and cut it out. 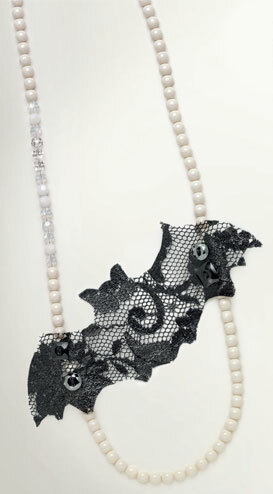 Put the lace bat on top of a piece of plastic wrap and strengthen it by applying resin using a paintbrush. Dry it overnight. 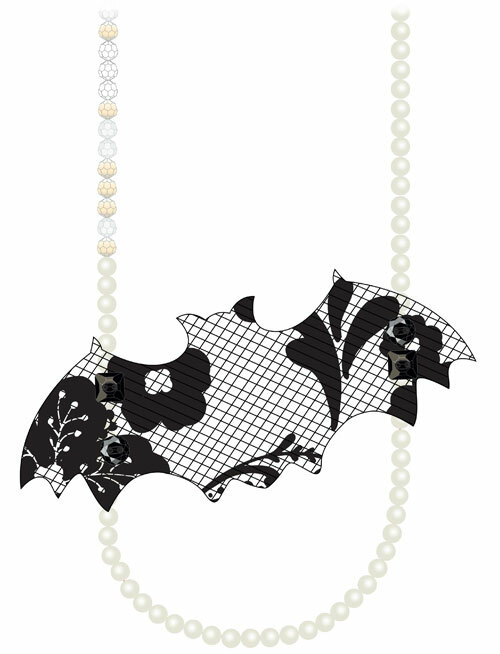 Attach the lace bat onto the necklace with pins. Cut 1m of buttonhole silk and make four back stitches on the bat. 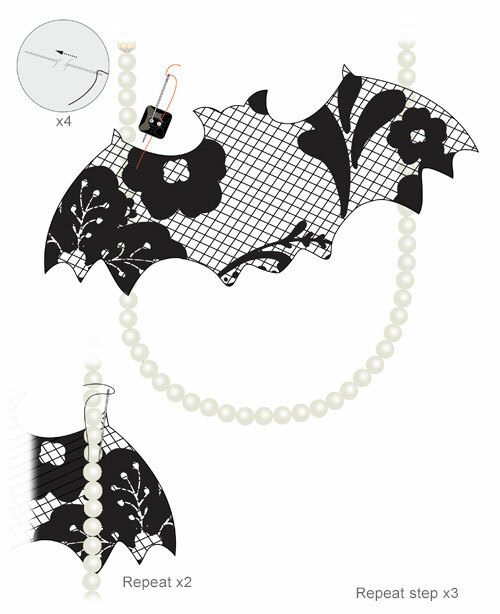 Stitch over to the top of the bat and insert one of the sew-on stones from the Swarovski crystal assortment onto the bat as shown. 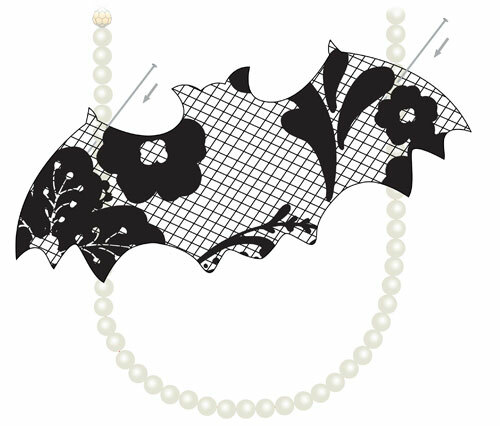 Attach the bat to the pearl and bead strand by winding the silk around and between the crystal pearls as you stitch on the sew-on stone. Repeat this step three times with the other three sew-on stones from the Swarovski crystal assortment as shown attaching both sides of the bat pattern onto the necklace.